University of Kashmir, Srinagar-190 006, Jammu and Kashmir, India. Ajuga is a medicinally important genus of the Himalayan region. This study was carried out on the phenotypic variability and reproductive allocation in two species of genus Ajuga, A. bracteosa and A. parviflora growing in variable habitats of Kashmir valley. Our findings clearly displayed significant divergence among sites which reveals a definite impact of altitude on morphological and reproductive features of the species under study. In A. bracteosa the plants growing at low altitudes are comparatively taller and produce more number of leaves, greater leaf dimensions and inflorescence number. But in case of A. parviflora a more or less reverse trend was seen. Principal component analysis (PCA) revealed that the habitat of Kangan and Dachigam proved relatively better for the growth of A. bracteosa and Brinal 2 and Gogaldara for A. parviflora. Maximum resources were allocated to the growth and development of the leaves followed by stem, root tubers and inflorescence in both the species. The reproductive effort was higher (40.48 ± 1.59) for the high altitude Betab valley population in case of A. bracteosa and was lowest for the high altitude Brinal 2 population (45.88 ± 1.37) in case of A. parviflora. 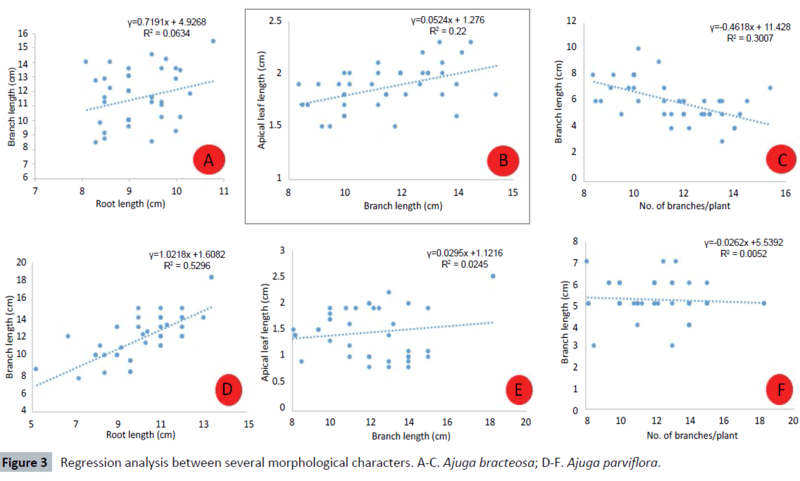 The regression analysis revealed a positive correlation between branch length and root length, branch length and apical leaf length in both the species and a negative correlation between branch length and number of branches per plant in both the species. Our results are very useful to introduce the species into cultivation and developing strategies for conservation. Plants are unable to escape the hazards of environment in which they grow because of their sessile habit. To cope with this, many plants undergo variation in one or more morphological characters in response to both abiotic (e.g., climate and weather) and biotic (e.g., grazing and competition) factors of the environment as an adjustment to resource availability. This adjustment to environment is generally referred as phenotypic plasticity . Recently more attention has been given to the acclimation of morphological, biochemical and physiological traits of plants along an altitudinal gradient [2-4]. Abiotic factors have a significant effect on the morphological variability, despite the fact that it may be due to ontogenic programming of the plant as well. Abiotic variables such as water stress, mineral nutrient deficiency and geographical position may have an impact on the overall plant morphology. For example, latitude is negatively correlated with plant height , while altitude may also affect the leaf morphology and plant height [6,7]. The plant morphological parameters such as height, leaf area and petiole length vary with different altitudes , with a progressive decrease in plant height with an increase in altitude. Many plants have smaller leaves at high altitudes [9-11]. These morphological adaptations are presumably associated with decrease in temperature as well as nutrient and water limitations [10,12]. It may also be an adaptive strategy against the hazardous impact of strong wind that normally blows at high altitude, thereby improving photosynthetic activities of plant [8,13]. The genus Ajuga L. consists of about 40-50 species  mostly distributed in the north temperate zone of world  also from Europe to Asia and Australia . Ajuga bracteosa Wall ex Benth. belongs to family Lamiaceae and is commonly called as Jan e adam. It is perennial, erect or ascending hairy herb, often prostrate with oblanceolate or sub-spathulate leaves . Various crude extracts of this plant have shown activities including antidiabetic, antioxidant, antibacterial, diuretic, stimulant, astringent, rheumatism, febrifuge, headache, earache and is also effective in jaundice, malarial fever and hypertension [18,19]. Ajuga parviflora is an annual or short lived perennial herb . It has been used as an astringent and for the treatment of swollen wounds, diarrhea, rheumatism, fever, eye trouble and for the diseases of bladder . They also have the cancer chemo-preventive, hypoglycemic and hypotensive effects . The present study was devised for the first time to understand the variation in growth characteristics and changes in allocation patterns in relation to the environmental conditions in two related species Ajuga bracteosa and A. parviflora growing at different altitudes of Kashmir Himalaya. Ajuga bracteosa was found growing in Kangan, Dachigam, Langanbal, Betab valley-Pahalgam, Gulmarg, Aharbal, Jawahar tunnel, Ferozpora, Drang and Duksum. A. parviflora was found growing in Gogaldara-Gulmarg, Aru-Pahalgam, Upper Munda, Jawahar Tunnel, Naranag and Aharbal. Four natural populations (Kangan, Dachigam, Drang and Betab valley-Pahalgam) of A. bracteosa and Brinal 1, Gogaldara, and Aru - Pahalgam and Brinal 2 of A. parviflora were selected for the present study on the basis of ease of access and availability (Figure 1). 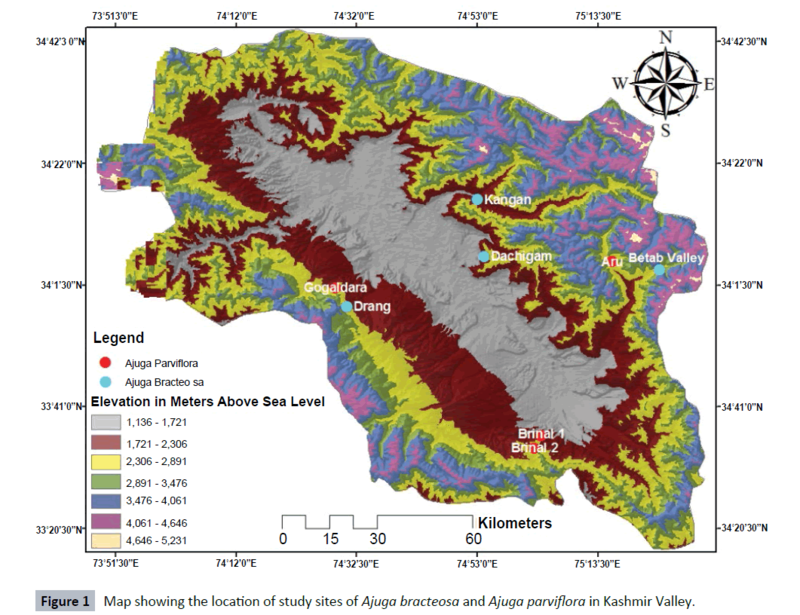 Figure 1 Map showing the location of study sites of Ajuga bracteosa and Ajuga parviflora in Kashmir Valley. The studies were carried out by selecting ten mature flowering individuals randomly from each population in order to observe the various morphological parameters of the species. The populations were analyzed for morphological traits like root length, branch length, number of branches per plant, number of leaves per plant, basal leaf length and breadth, apical leaf length and breadth, inflorescence number per plant and number of flowers per inflorescence. The plants were measured in situ and most of these parameters were recorded at flowering stage in all the populations. We used linear regression analysis to determine the correlation between various morphological parameters across the altitudinal gradient. Principal component analysis (PCA) was carried out to analyze the morphological traits in relation to habitat dynamics and to infer the coherence between different vegetative and reproductive parameters. Ten mature and healthy flowering plants from all the natural populations were harvested for the study of resource partitioning in different parts of a plant. The plants were fragmented into individual parts such as root, branches, leaves and inflorescence. Using an electronic balance, fresh weight (weighing as fresh) and dry weight (after oven-drying for 48 h at 80°C) of the plants were determined following Kawano and Masuda . Reproductive effort (RE) was calculated from the estimates of dry weight or biomass allocated to reproductive and vegetative structures following Yaqoob and Nawchoo . ANOVA was used to test for differences between populations for all the morphological characters measured using the SPSS 16.0 software. Tukey’s multiple comparison of means was used to compare all populations and the differences between individual means were deemed to be significant at p ≤ 0.05. Present investigation revealed a wide range of suitable habitats for the growth of A. bracteosa and A. parviflora (Figure 2). A. bracteosa thrives best in the open rocky slopes and landslide areas; while as A. parviflora prefers moist or rocky shady slopes in association with coniferous forests. Ajuga bracteosa is perennial, erect or ascending hairy herb, often prostrate, oblanceolate or sub-spathulate leaves. Flowers are white or purplish-violet tinged from lower surface in distant, axillary whorls in spike. A. parviflora is an annual or short-lived perennial. Stems spreading or ascending, usually unbranched, with a sparse to dense eglandular indumentum of long villous multicellular hairs. Leaves may be rosette-forming, obovate-spathulate, petiolate, with multicellular eglandular hairs, thin-texture; inflorescence unbranched verticillaster. It usually flowers between March-June. Ajuga parviflora is unusually densely villous in comparison with other species. Figure 2 Different types of habitats of Ajuga spp. in Kashmir Valley. A. Ajuga bracteosa in rocky lands; B. Ajuga bracteosa on rocky slope; C. Ajuga parviflora near coniferous forests; D. Ajuga parviflora in coniferous forest slopes. Both the species exhibits a considerable variability in the morphological traits under different environmental conditions (Tables 1 and 2). Highly significant differences among populations were observed in branch length, branch number per plant, leaf dimensions, leaf number per plant, inflorescence number per plant and flower number per inflorescence. A peculiar variability was found in the branch length of A. bracteosa which was highest in plants growing at low altitude sites Dachigam and Kangan (12.26 ± 0.80 and 13.47 ± 0.71 cm) and lowest in plants growing at Betab valley (9.53 ± 0.89 cm). Besides, the number of leaves per plant, basal leaf length and inflorescence number per plant were also maximum (51.5 ± 4.60, 3.91 ± 0.24 cm and 19.6 ± 1.95, respectively) in the plants at low altitude site, Kangan and were minimum (31.5 ± 5.98, 2.61 ± 0.37 cm and 13.6 ± 0.96) in the plants at high altitude site, Betab valley. It was found that certain morphological traits like the number of branches per plant and number of flowers per inflorescence showed a different trend; being highest (7.6 ± 1.17 and 5.1 ± 0.73) in plants at high altitude site and lowest (4.7 ± 0.94 and 4.8 ± 0.63) in plants at lowest altitude site. Table 1 Morphological variations (mean ± SD) in several plant characters recorded among four different populations of Ajuga bracteosa across the study sites. Table 2 Morphological variations (mean ± SD) in several plant characters recorded among four different populations of Ajuga parviflora across the study sites. A similar trend was observed in plants of A. parviflora, wherein the growth parameters like branch length, root length and number of leaves per plant were maximum (13.8 ± 0.91 cm; 11.5 ± 0.84 cm and 24.3 ± 1.49 respectively) in plants growing at low altitude site Brinal 1 and were minimum (10.11 ± 1.96 cm; 9.27 ± 1.21 cm and 20.7 ± 2.45) in the plants growing at high altitude site Brinal 2. The features like the inflorescence number per plant and the number of flowers per inflorescence were however higher (24.5 ± 4.74 and 5.8 ± 0.42) in the plants growing at high altitude as compared to those (21 ± 3.29 and 4.9 ± 0.74) growing at low altitude site. 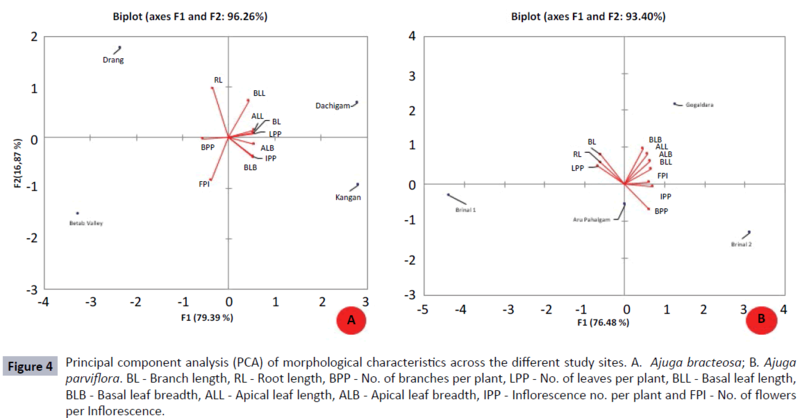 A positive correlation between root length and branch length, branch length and apical leaf length and a negative correlation between number of branches per plant and branch length was observed in both the species (Figure 3). Principal component analysis (PCA, Figure 4) of all morphological characters across the study sites reveals that the major differences between populations were due to size characteristics in both the species. In case of A. bracteosa, PCA reveal that the high altitude populations are non-favorable to most of the vegetative and reproductive traits indicating better growth conditions at lower altitudes. In case of A. parviflora, a reverse trend was observed. In case of A. bracteosa, apical leaf breadth, Inflorescence number per plant and basal leaf breadth were found to be favoring the Kangan population. Basal leaf length, apical leaf length, branch length, number of leaves per plant were found to be favoring the Dachigam population. In case of A. parviflora, apical leaf length, apical leaf breadth, number of flowers per Inflorescence, basal leaf length and basal leaf breadth were found to be favoring the Gogaldara population. Inflorescence number per plant and number of branches per plant were found to be favoring the Brinal 2 population. Thus, the habitat of Kangan and Dachigam proved relatively better for the growth of A. bracteosa while as the habitat of Gogaldara and Brinal 2 proved relatively better for the growth of A. parviflora. Figure 3 Regression analysis between several morphological characters. A-C. Ajuga bracteosa; D-F. Ajuga parviflora. Figure 4 Principal component analysis (PCA) of morphological characteristics across the different study sites. A. Ajuga bracteosa; B. Ajuga parviflora. BL - Branch length, RL - Root length, BPP - No. of branches per plant, LPP - No. of leaves per plant, BLL - Basal leaf length, BLB - Basal leaf breadth, ALL - Apical leaf length, ALB - Apical leaf breadth, IPP - Inflorescence no. per plant and FPI - No. of flowers per Inflorescence. The partitioning of resources is non-uniform among different parts of the plants of A. bracteosa (Table 3). There was a remarkable difference in total above ground dry weight biomass and dry weight of different vegetative structures among the plants of studied populations, growing at different altitudes. Maximum resources were allocated towards the growth and development of leaves (0.572 ± 0.12 g to 0.659 ± 0.260 g) followed by root (0.400 ± 0.072 g to 0.514 ± 0.047 g) and branches (0.340 ± 0.041 g to 0.624 ± 0.057 g) while the least resources were allocated towards inflorescence (0.091 ± 0.222 g to 0.208 ± 0.030 g). A somehow similar trend was followed by the plant parts of A. parviflora (Table 4). Maximum resources were allocated towards the growth and development of leaves (0.369 ± 0.057 g to 0.521 ± 0.224 g) followed by branches (0.173 ± 0.034 g to 0.437 ± 0.085 g) and root (0.131 ± 0.009 g to 0.413 ± 0.048 g) while the least resources were allocated towards inflorescence (0.087 ± 0.014 g to 0.499 ± 0.130 g). Table 3 Allocation of resources (mean ± SD) in the form of dry weight (g) toward different plant parts in Ajuga bracteosa across the study sites. Table 4 Allocation of resources (mean ± SD) in the form of dry weight (g) toward different plant parts in Ajuga parviflora across the study sites. The total resource budget per plant of low altitude and high altitude populations varied to a greater extent in both the species. In case of A. bracteosa, the values were maximum in high altitude Betab Valley (1.971 ± 0.389 g) population and were least in the low altitude populations. In case of A. parviflora a reverse trend was seen andthe values were maximum in the low altitude Brinal 1 (1.829 ± 0.168 g) population and were least in the high altitude populations. Also the percentage allocation to reproductive parts, i.e., reproductive effort showed a similar trend being more (40.48 ± 1.59) for the high altitude Betab Valley population in case of A. bracteosa and (51.17 ± 4.01) for the low altitude Brinal 1 population in case of A. parviflora. In the present study, considerable phenotypic variability was observed within and across the individuals of different populations of A. bracteosa and A. parviflora growing along the altitudinal gradient in the Kashmir valley. The morphological characteristics and resource allocation patterns showed both inverse as well as direct correlation with the altitude. Plant height decreased with an increase in altitude, an adaptive phenomenon to protect the plant against the severe conditions at higher altitudes [25,26]. The harsh climatic conditions as well as the shorter growing season results in the overall slow growth rate, which in turn enables the plants to efficiently utilize the available resources . The reduced plant height at higher altitude prevents the damaging effects caused by the strong winds prevalent at high elevations and keeps the leaves closer to warmer soil to enhance its photosynthetic efficiency . However, the decrease in plant height is compensated by a concomitant increase in the number of branches in the plants growing at higher altitudes. The present study revealed that the plants growing at low altitudes are comparatively taller and produce more number of leaves. Our results are supported and confirmed by the observations of Johnson and Cook , Hickman  and Bresson et al. who have also observed a reduction in length, breadth and area of leaves with an increase in altitude. However, in this study, leaf dimensions show a contrasting trend being greater in low altitude populations in case of A. bracteosa and in high altitude populations in case of A. parviflora. The reproductive effort also shows a contrasting trend and in case of A. bracteosa, plants growing at higher altitudes had more reproductive effort than the plants growing at lower elevations. These findings are in conformity with Fabbro and Korner  and Molina-Montenegro et al. but in case of A. parviflora, a reverse trend was observed. We propose that the heterogeneity of the environmental conditions is the main source of phenotypic variation of two Ajuga species. Our observation revealed a wide range of suitable habitats for the growth of A. bracteosa and A. parviflora. With increased altitude, a significant decrease is found in the phenotypic characteristics of A. bracteosa, thus it seems that these sites endure a larger environmental stress. But in case of A. parviflora a reverse trend was seen. Increasing altitude resulted in a decrease in the allocation of biomass to reproductive structures in the form of decreasing dry weight. However, future studies should explore the phenotypic plasticity in more detail in plants growing at contrasting environments in order to evaluate precisely the contribution of the phenotypic plasticity to the phenotypic variation in different Ajuga species. The author acknowledges UGC for providing fellowship under FIP scheme. Sattarian A, Akbarian MR, Zarafshar M, Bruschi P, Fayaz P (2011) Phenotypic variation and leaf fluctuating asymmetry in natural populations of Parrotia persica (Hamamelidaceae), an endemic species from the Hyrcanian forest (Iran). Acta Botanica Mexicana 97: 65-81. Sakata T, Nakano T, Yokoi Y (2006) Altitudinal changes in Rubisco and APX activities in Aconogonum weyrichii in the alpine region of Mt. Fuji. Polar Biosci 19: 115-122. Kumar N, Vats SK, Kumar S, Ahuja PS (2008) Altitude-related changes in activities of carbon metabolism enzymes in Rumex nepalensis. Photosynthetica 46: 611-614. Guerin GR, Wen HX, Lowe AJ (2012) Leaf morphology shift linked to climate change. Biol Lett 8: 882-886. Moles AT, Warton DI, Warman L, Swenson NG, Laffan SW, et al. (2009) Global patterns in plant height. J Ecol 97: 923-932. Ran F, Zhang X, Zhang Y, Korpelainen H, Li C (2013) Altitudinal variation in growth, photosynthetic capacity and water use efficiency of Abies faxoniana Rehd. et Wils. seedlings as revealed by reciprocal transplantations. Trees 27: 1405-1416. Vitasse Y, Lenz A, Kollas C, Randin CF, Hoch G, et al. (2013) Genetic vs. non-genetic responses of leaf morphology and growth to elevation in temperate tree species. Funct Ecol 28: 243-252. Kofidis G, Bosabaldis AM, Moustakas M (2003) Contemporary seasonal and altitudinal variations of structural features in Oregano (Origanum vulgare L.). Annals of Botany 92: 635-645. Morecroft MD, Woodward FI (1996) Experiments on the causes of altitudinal differences in the leaf nutrient contents, size and δ13C of Alchemilla alpina. New Phytologist 134: 471-479. Cordell S, Goldstein G, Mueller-Dombois D, Webb D, Vitousek PM (1998) Physiological and morphological variation in Metrosideros polymorpha, a dominant Hawaiian tree species, along an altitudinal gradient: the role of phenotypic plasticity. Oecologia 113: 188-196. Venema JH, Eekhof M, Van Hasselt PR (2000) Analysis of low temperature tolerance of a tomato (Lycopersicon esculentum) cybrid with chloroplast from a mor chillin-tolerant L. hirsutum accession. Annals of Botany 85: 799-807. Kao WY, Chang KW (2001) Altitudinal trends in photosynthetic rate and leaf characteristics of Miscanthus populations from central Taiwan. Australian Journal of Botany 49: 509-514. Korner C, Cochrane PM (1983) Stomatal responses and water rela-tions of Eucalyptus pauciflora in summer along an elevational gradient. Oecologia 66: 443-455. Ali SI, Nasir YJ (1990) Flora of Pakistan. BCC and T Press, University of Karachi, 192: 14. Turrill WB (1934) The correlation of morphological variation with distribution in some species of Ajuga. New Phytologist 33: 218. Keng H (1969) Flora Malesiana Precursores XLVII. A revision of Malesian Labiatae. Gard Bull Straits Settlem 26: 13-180. Pal A, Jadon M, Katare YK, Singour PK, Rajak H, et al. 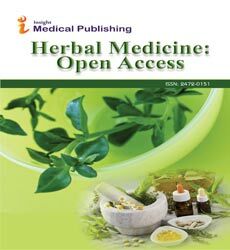 (2011) Ajuga bracteosa wall: A review on its ethnopharmacological and phytochemical studies Der Pharmacia Sinica 2: 1-10. Arfan M, Khan GA, Ahmed N (1996) Physio-chemical evaluation and biological activity of ajuga bracteosa wall and viola odoroto linn. Chem Soc Pak 18: 2. Shah GM, Khan MA (2006) Common Medicinal Folk Recipes of Siran Valley, Mansehra, Pakistan. Ethnobotanical Leaflets 10: 49-62. Nawaz HR, Malik A, Khan PM, Saeed A (1999) Ajugin E and F: Two withanolides from Ajuga parviflora. Phytochem 52: 1357. Manjunath BL (1948) The Wealth of India, Delhi: Council of Scientific and Industrial Research, p: 254. Coll J, Tandron YA (2008) Neo-clerodane diterpenoids from Ajuga: structural elucidation and biological activity. Phytochemistry Reviews 7: 25-49. Kawano S, Masuda I (1980) Resource allocation and reproductive capacity in wild populations of Heloniopsis orientalis (Thunb) C Tanaka (Liliaceae). Oecologia 45: 307-317. Yaqoob U, Nawchoo IA (2015) Impact of habitat variability and altitude on growth dynamics and reproductive allocation in Ferula jaeschkeana Vatke. Journal of King Saud University - Science. Korner C (2003) Alpine Plant Life. Springer, Heidelberg, Germany. Willis SG, Hulme PE (2004) Environmental severity and variation in the reproductive traits of Impatiens glandulifera Funct Ecol. 18: 887-898. Bennington CC, McGraw JB (1995) Natural-selection and ecotypic differentiation in Impatiens pallida. Ecol Monogr 65: 303-323. Johnson MP, Cook SA (1968) Clutch size butter cups. American Naturalist 102: 405-411. Hickman J (1975) Environmental unpredictability and plastic energy allocation strategies in the annual Polygonum cascadense (Polygonaceae). Journal of Ecology 63: 689-701. Bresson CC, Vitasse Y, Kremer A, Delzon S (2011) To what extent is altitudinal variation of functional traits driven by genetic adaptation in European oak and beech? Tree Physiol 31: 1164-1174. Fabbro T, Korner C (2004) Altitudinal differences in flower traits and reproductive allocation. Flora 199: 70-81. Molina-Montenegro MA, Penuelas J, Munne-Bosch S, Sardans J (2012) Higher plasticity in ecophysiological traits enhances the performance and invasion success of Taraxacum officinale (dandelion) in alpine environments. Biol. Invasions 14: 21-33.